If you know how git works, you are perfectly aware that, even if you work in operating systems with case insensitive file system, all commit are case sensitive. Sometimes if you change the case of a folder, then commit modification of files inside that folder, you will incur into problems, because if casing of the path changes, the files are different for the Git Engine (but not for operating systems like windows). 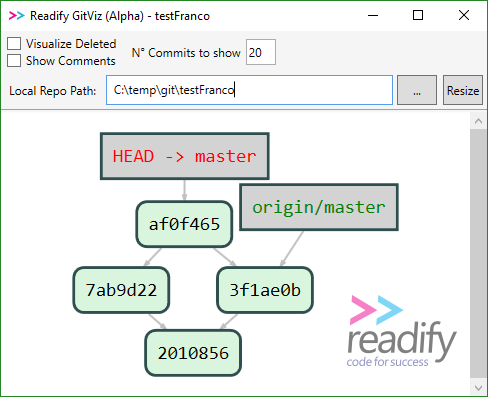 In the long run you will face some annoying problems, like git showing that some of the files are modified (while you didn’t touch them) and you are unable to undo changes or work with those files. This problem will become really annoying during rebase operations. Luckily enough, Azure DevOps has an option for Git Repository where you can have the engine prevent commits that contains file names with only case differences, to avoid this problem entirely. The first option completely blocks pushes that contains files not compatible across platform and is the option that we are looking for, because it will block you from pushing code that will lead to case sensitiveness problems. The other two options are equally needed, because the second one will prevent you from pushing path with forbidden names or incompatible characters (remember that this is different between Windows and Linux). Finally the third one will block pushes that contains path with unsupported length, a problem that is really nasty for Windows Users. In the end, if you have case sensitiveness problem in your repository and you already pushed your code, because you did not have these option enabled, I can suggest you a nice tool available in GitHub that find all problems in the repository and fix them, it is called Git Unite. 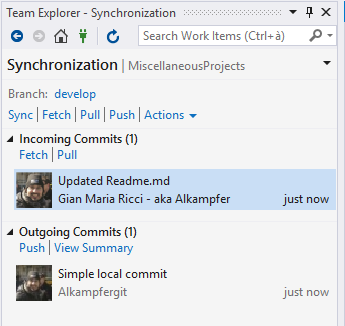 You can clone the project, compile in visual studio then just launch from command line giving path of a local git repository as single arguments and it will do everything automatically. Clearing Windows Credential Manager does not solves the problem, you still have the same error even if you clone again the repo in another folder. 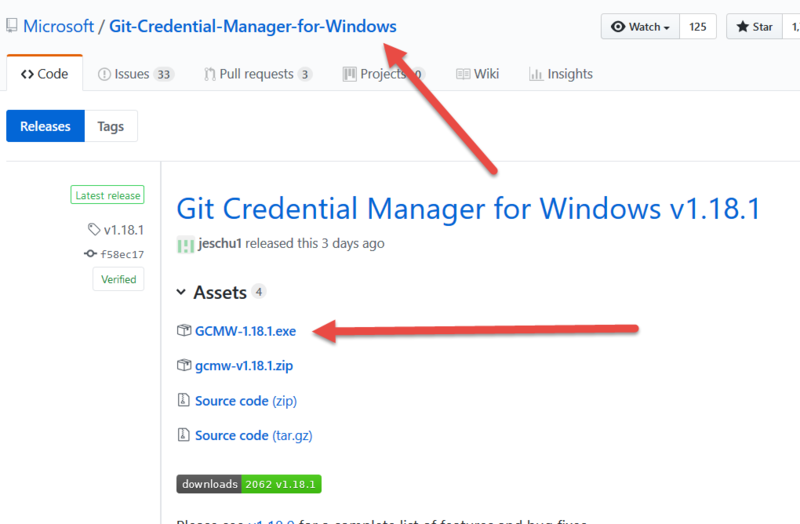 To fix this you can simply download and install the newest version of the Git Credential Manager for windows. You can find everything at this address. Just install the newest version and the problem should be solved. I’m a great fan of rebasing over merge and I’m convinced that the default pull should be a fetch and rebase, using fetch and merge only when it is really needed. Not having the option to configure a GUI to do a pull –rebase is a really annoying problem, that can be somewhat limited configuring pull.rebase git option to true, as explained in previous post. Actually, the lack of rebase on pull option makes me stop using the IDE. 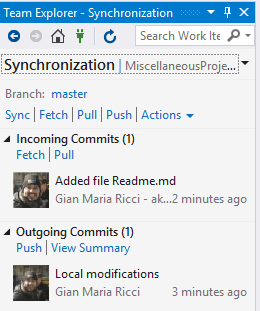 To have a linear history in Git, always consider rebase over merge, especially for everyday pulls. 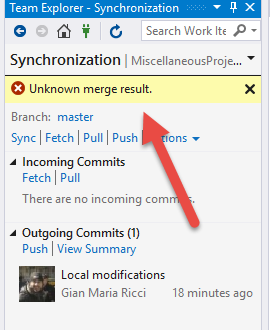 I’ve used this technique extensively with VS 2017, the only drawback is an error during pull because VS complains about “unknown merge result” since he was not able to find merge commit. Give this, I was always reluctant to suggest to customers, because it is not good having your IDE constantly show error at each pull. After updating to 15.5 version I noticed that the error went away and the IDE correctly tells me that a pull with a rebase occurred. 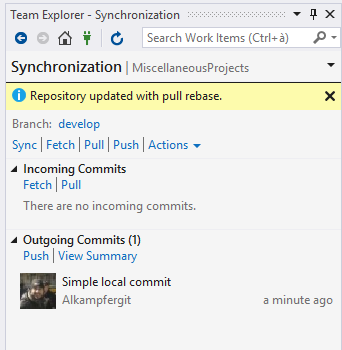 If I open the global or repository settings in Team Explorer I can found that now, finally, pull.rebase is supported. Figure 1: Pull with rebase is now supported, as well as other interesting options. Now if you simply press the pull command in the IDE, you will see that VS is correctly issuing a rebase. When everything is finished you are informed that indeed a rebase was done, the error went away. 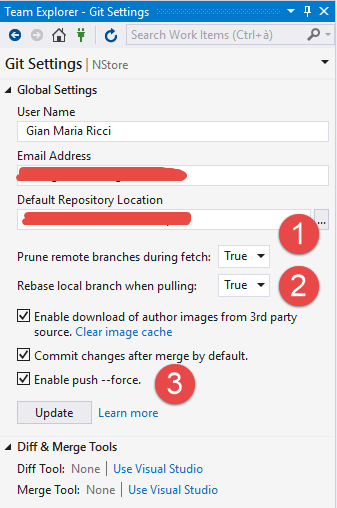 Figure 3: Visual Studio correctly rebased local branch on the remote branch. 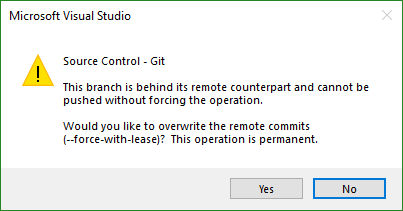 With this latest addition I can confirm that Visual Studio is now a really interesting IDE to work with Git (even if, if you are experienced with Git, probably you will still stick in CommandLine most of your time). P.s: Another nice addition is the support to prune after fetch and support to push –force. If you try to push a commit after an amend, instead of the standard error, you will be prompted with a MessageBox that asks you if you really want to force the push. Figure 4: MessageBox asking for a push force if needed. If you are curious about why VS is using a –force-with-lease instead of a standard –force, please read this article. Basically it is a way to force the push if no one had pushed something else in the meanwhile. If you really need to force a push, like when you rebase a feature branch, you can always use commandline. 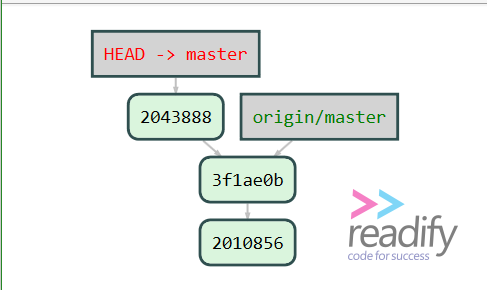 From the comment you can see that the incoming commit is a simple add of readme.md file , this is unrelated to the modification done by developer, but if he press the pull button here is the result. You can just ignore the error in Visual Studio and accept the fact that now, whenever you press the Pull button in Visual Studio you will trigger a pull with a rebase instead that a pull with merge. This technique is not going to work with older version of Visual Studio, because they used the LibGit2Sharp library. 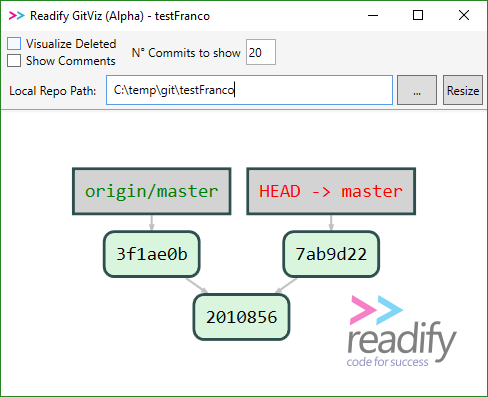 Git is an exceptional piece of software and I really cannot think living without it. Now with superfast SSD, you can use git without performance problem even for large repositories (maybe you converted an old Subversion or TFVC). You can run from time to time (documentation say you can run every few hundreds commits), it will take longer that a normal git gc, but it will help keeping your local git repository fast even if you work with really large codebase.